Under President Trump, ICE has significantly increased deportations of undocumented migrants with non-criminal records. Image via Wikimedia Commons/public domain. No uploader information given. Roxana Orellana Santos was arrested for an immigration offense in 2008, sitting outside a restaurant and eating a sandwich. Eleven years later, her lawsuit was almost over–but ICE has again taken her into custody. Roxana Orellana Santos was arrested for an immigration offense in 2008. The woman was sitting on a curb and eating a sandwich outside a Frederick County, Md. restaurant. Santos, writes the Washington Post, was approached by sheriff’s deputies just before she was due to begin working. Prodded for identification, Santos was arrested after the deputies discovered she had an outstanding deportation order. Santos stayed in jail for 45 days, handed off to immigration agents. A recent ruling in Santos’ long-lasting lawsuit found that the deputies’ decision was likely unconstitutional. 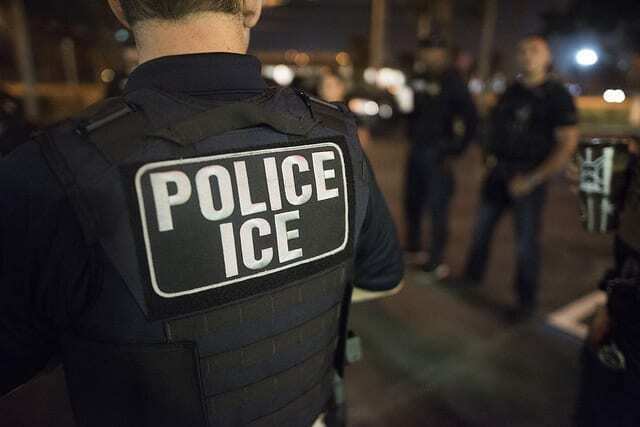 “We hold that, absent express direction or authorization by federal officials, state and local law enforcement officers may not detain or arrest an individual solely based on known or suspected civil violations of federal immigration law,” the court concluded. But on Tuesday, reports the Post, Santos was again detained by U.S. Immigration and Customs Enforcement. Nearing the end of her suit against Frederick County—and a settlement—a judge had urged Santos to remain in the United States until the case could be resolved. Rather conveniently, the government shutdown has prevented ICE from issuing a statement or offering any spokesperson for comment. Frederick County had, in 2008, entered into a contract with ICE. Some deputies would be trained to ‘flag’ undocumented immigrants and hold them in detention until federal officers could take them into custody. But neither of the two deputies who approached Santos were ICE-trained. Even if they had been, said a 4th Circuit Court ruling, they’d initiated the arrest without any provocation or order from immigration officials. The Washington Post claims that federal courts have consistently found such practices to be illegal. Sheriff’s deputies and local police lack the authority to enforce or enact arrests over civil violations, which include most immigration violations. Moreover, there was no probable cause in Santos’ arrest—the woman was simply sitting on the sidewalk and eating a sandwich when deputies began an impromptu interrogation. “We believe she was racially profiled by the deputies for what we call ‘eating while brown,’” Perez said. Perez says Santos’ attorneys plan to reopen her case in a bid to prevent her deportation. Although ICE hasn’t made its intentions for Santos clear, her lawyers believe agents will try to deport her despite her pending litigation.